This book’s primary goal is to give a non-Dutch lawyer a basic understanding of the Dutch financial regulatory environment. 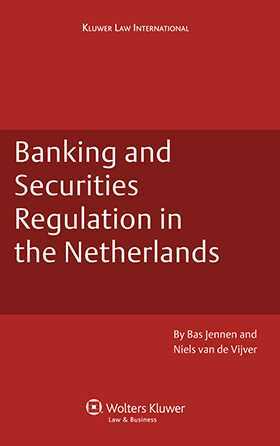 In most countries financial regulation is not the easiest accessible area of the law and the Netherlands is no exception. For anyone involved in the Dutch financial industry this book will prove an indispensable toll to have some meaningful insights into the Dutch regulatory landscape. The authors are experienced practitioners who have advised domestic and international clients on Dutch financial law for many years. Together they also have extensive transactional experience as well as considerable in-house experience at both the Dutch financial regulators. Bank and Financial Securities Regulation in the Netherlands will prove a practical and comprehensive guide for non-Dutch lawyers as well as businesses and individuals who are active in the Dutch financial industry. It may also help- other Dutch lawyers to advise their non-Dutch counterparts on some of the intricacies of Dutch financial law.